The Collaborative is committed to helping advocates, policymakers and the public better understand the problem of diesel in our communities. Equally important, it’s clear that the diesel problem can be solved, so much of our materials focus on solutions for making our air cleaner and our communities healthier. In 2015-2016, the Alameda County Transportation Commission (ACTC) developed an Alameda County Goods Movement Plan to outline a long-range strategy for how to transport freight efficiently, reliably and sustainably within, to, from and through Alameda County by roads, rail, air and water. One of the draft Plan’s five stated goals is to “reduce and mitigate impacts from goods movement operations to create a healthy and clean environment, and support improved quality of life for those communities most burdened by goods movement.” To help make the draft Plan as successful as possible in advancing this goal, the Diesel Collaborative commissioned a Health Impact Assessment (HIA) of the draft Alameda County Goods Movement Plan. The HIA aims to advance this goal of improving health and quality of life by outlining ways that future changes to the county’s freight system can be implemented to maximize benefits and minimize harms to health in impacted communities. The system of transporting raw materials and products from where they are made to where they are sold -- also known as goods movement or freight transport – benefits some communities more than others. 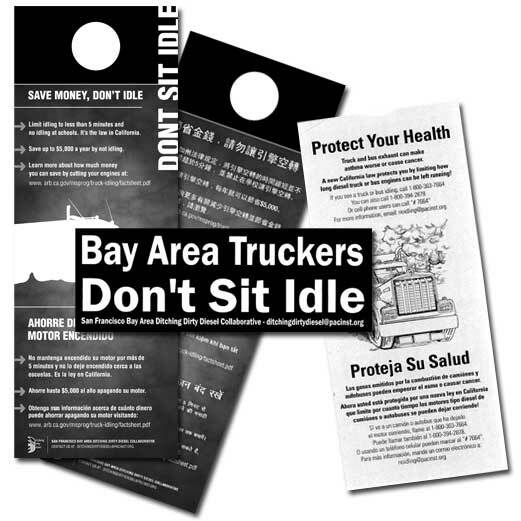 As this HIA shows, communities next to freight hubs and corridors like freeways, designated truck routes, ports, and rail lines bear the brunt of diesel pollution and other negative impacts of Alameda County’s freight transport system. This HIA identifies the potential impacts of proposed changes to the county’s freight transport system as detailed in the draft Alameda County Goods Movement Plan. The HIA then outlines ways that the implementation of this draft Plan can better protect and improve the health of all communities, including those most impacted by the county’s freight transport system. The full HIA is now online. For more information on ACTC's plan, visit its website. 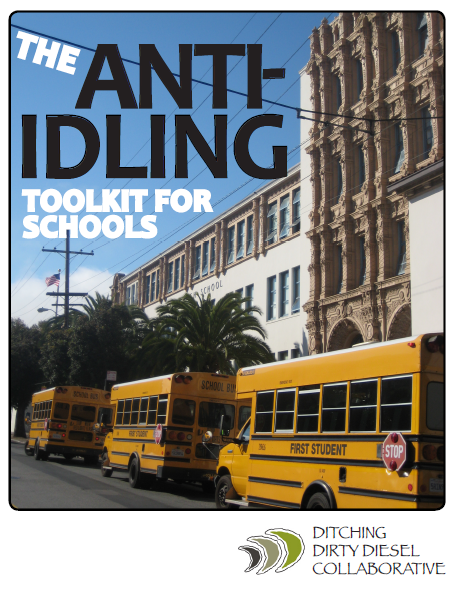 "Anti-Idling Toolkit for Schools": Based on the experiences and expertise of DDDC members' anti-idling work over the years, DDDC created a toolkit designed for school teachers, school staff, student groups, parents, and other outside advocates to take the lead in creating a healthier school environment. Packed with curriculum, factsheets, and media and outreach materials, this toolkit outlines plans for each stakeholder in the school community to be engaged and active in creating idle-free schools. Download the full toolkit or sections of the toolkit (right click and choose "Save link as"). 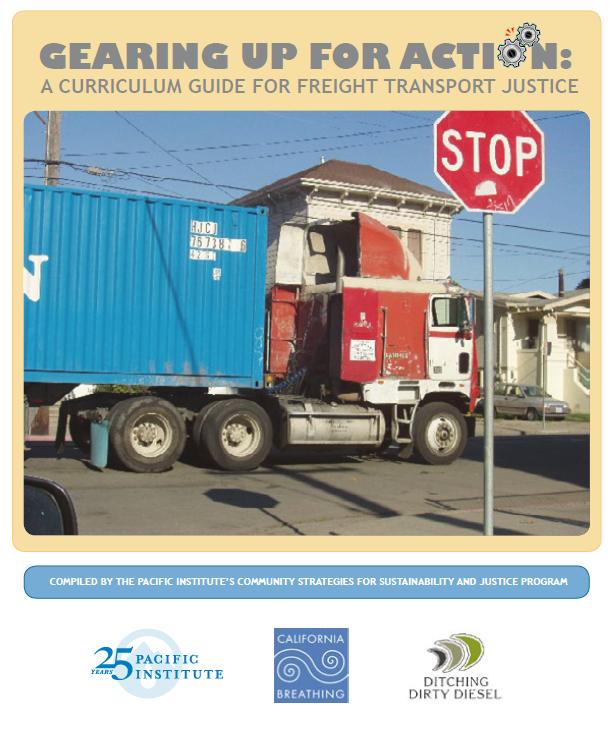 The Pacific Institute’s revised "Gearing Up for Action: A Curriculum Guide for Freight Transport Justice" (en español, "Preparándose para la Acción") is an important advocacy tool to build the power and capacity of communities to participate in decision making around freight transport issues. The activities have been designed to help community leaders engage groups of community members to learn more about freight transport and connect it to their own lives. The goal of our freight transport justice work is to reduce the adverse health impacts of freight transportation on low-income neighborhoods of color closest to freight transport hubs, and to increase the share of the benefits that residents of these communities enjoy. DDDC was one of the partner organizations who contributed to the activities and materials included in this guide. Read more about "Gearing Up for Action" on Pacific Institute's site. "Gearing Up" can also be directly downloaded here. 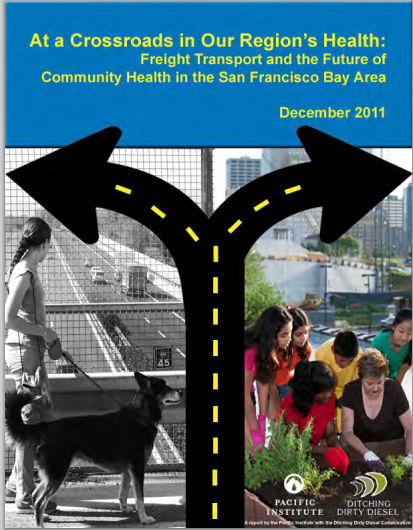 In collaboration with the Pacific Institute, DDDC published "At a Crossroads in Our Region's Health: Freight Transport and the Future of Community Health in the San Francisco Bay Area." Priority Development Areas in the San Francisco Bay region overlap with communities with the highest health risk from toxic air contaminants, including diesel pollution from freight transport, designated as CARE zones by the Air District. But this new study found that 74% of the land in Priority Development Areas that intersect with CARE communities is far enough away from freight transport hazards to be suitable for sensitive land uses like new housing. With wise regional planning, decision-makers have the power to develop the region’s economic capacity while protecting the health of vulnerable communities. The new analysis maps the Priority Development Areas, with 45 detailed local maps of five Bay Area counties. Download the report today! 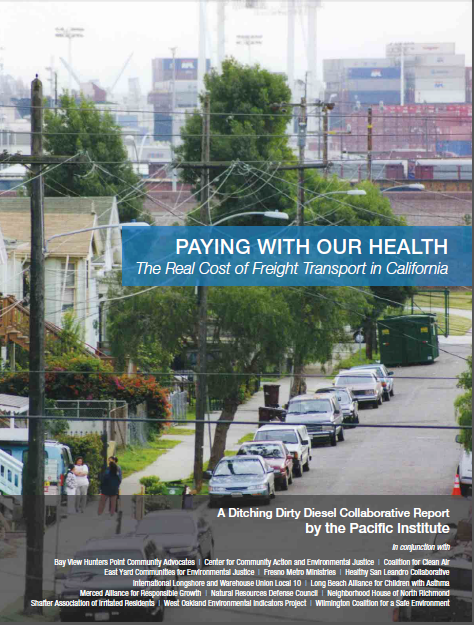 “Paying With Our Health: The Real Cost of Freight Transportation in California,” published in collaboration with the Pacific Institute. The ground-breaking report shines a light on a freight transport system that hurts community health, what it would cost to clean it up, and how to improve it. Copyright © 2019. Ditching Dirty Diesel.